As most satire sites know, the more offensive an article, the better. But it's not enough to simply offend: in order to raise your writing above the semi-literate, orthographically-challenged raging rants that are endemic to the internet, a modicum of sophistication is required, both in technique and choice of target. This doesn't mean that every article needs to cite Wittgenstein; I've written at least a couple of articles about muppets, if I recall correctly. But you do need to watch what you're doing. 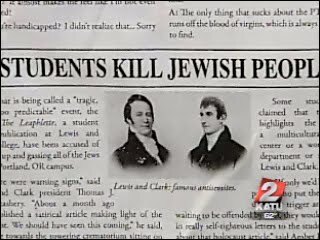 So when the Reed College humor publication Pamphlette wrote a fake news story about nearby rival campus Lewis and Clark gassing all the Jews it's not surprising that the backlash was both swift and strong (although, to Reed's credit, it didn't censor the paper despite severely criticizing it). You'd expect anyone using the Holocaust as inspiration for satire to come under the gun. And indeed, the students apologized, but to no avail. But the real reason the article was so hotly protested was - and this is an important point - someone had been drawing swastikas on the wall at Lewis and Clark not long before. In other words, there was an actual issue of anti-semitism (however minor) on the target campus (although the Pamphlette writers claimed not to be aware of this). Reed is now catching heat both for fostering anti-semitism and for not censoring the article in question. The thing to remember is, although nowadays satire is often confused with simple humor, it's actually a potent form of social commentary that can be very dangerous. They're just words, but as more than one writer has found out, words can be real weapons. We're privileged to enjoy a great deal of free speech. But as with anything dangerous, handle with care.